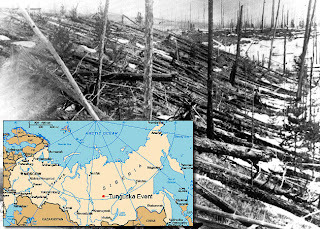 The Tunguska event – was a large explosion, most likely caused by a meteoroid or comet, in what is now Krasnoyarsk Krai, Russia in June 1908. Night skies as far away as London were reportedly brighter for several evenings. Unsupported theories regarding the event include the impact of a miniature black hole or large body of antimatter, ball lightning, a test by Nikola Tesla of the apparatus at Wardenclyffe Tower, and a UFO crash. Another theory is that the explosion was caused by a piece of Biela's Comet from 1883. There was little scientific curiosity about the impact at the time, possibly due to the isolation of the Tunguska region. The behaviour of meteorites in the Earth's atmosphere was less well understood during the early decades of the 20th century. Due to this, as well as the paucity of relevant data resulting from Soviet secrecy during the Cold War, many other hypotheses for the Tunguska event have sprung up, none of which are accepted by the majority of the scientific community. One study "suggests that a chunk of Comet 2005 NB caused the 5–10 megaton fireball, bouncing off the atmosphere and back into orbit around the sun." The scientists involved in the study claim that the object that caused the event will pass close to Earth again in 2045. In 1989, Serge J.D. D'Alessio and Archie A. Harms suggested that some of the deuterium in a comet entering the Earth's atmosphere may have undergone a nuclear fusion reaction, leaving a distinctive signature in the form of carbon-14. They concluded that any release of nuclear energy would have been almost negligible. Independently, in 1990, César Sirvent proposed that a deuterium comet, i.e., a comet with an anomalous high concentration of deuterium in its composition, could have exploded as a natural hydrogen bomb, generating most of the energy released. The sequence would be first a mechanical or kinetic explosion, triggering a thermonuclear reaction. These proposals are inconsistent with our knowledge of the composition of comets and of the temperature and pressure conditions necessary for initiating a nuclear fusion reaction. Studies have found the concentration of radioactive isotopes in the blast region to be inconsistent with those expected following a nuclear explosion, fusion or otherwise. Edward Drobyshevski, has suggested that the event was caused by the explosion of the hydrogen-saturated part of the nucleus of a comet that struck the Earth's atmosphere, with most of the remaining comet nucleus surviving, and possibly continuing to orbit the sun. In 1973, Albert A. Jackson and Michael P. Ryan, physicists at the University of Texas, proposed that the Tunguska event was caused by a small (around 1017 kg to 1019 kg) black hole passing through the Earth. This hypothesis is considered flawed, as there was no so-called exit event, a second explosion occurring as the black hole, having tunnelled through the Earth, shot out the other side on its way back into space. Based on the direction of impact, the exit event would have occurred in the North Atlantic, closer than the impact event to the seismic recording stations that collected much of the evidence of the event. The hypothesis also fails to account for evidence that cosmic material was deposited by the extraterrestrial body, including dust trails in the atmosphere and the distribution of high-nickel magnetic spherules around the impact area. In 1941, Lincoln LaPaz, and later in 1965, Clyde Cowan, Chandra R. Atluri, and Willard F. Libby suggested that the Tunguska event was caused by the annihilation of a chunk of antimatter falling from space. Antimatter is the extension of the concept of the antiparticle to matter, where antimatter is composed of antiparticles in the same way that normal matter is composed of particles. As with the above hypothesis described, this does not account for the mineral debris left in the area of the explosion. Oliver Nichelson suggested that the Tunguska explosion may have been the result of an experiment by Nikola Tesla using the Wardenclyffe Tower, performed during one of Admiral Robert Peary's North Pole expeditions. The Wardenclyffe Tower was an early wireless telecommunications tower designed by Tesla and intended for commercial trans-Atlantic wireless telephony, broadcasting, and to demonstrate the transmission of power without interconnecting wires.This theory failed to gain any adherents because of the lack of positive evidence, the presence of meteoroid fragments in soils and trees from the time, and the fact that the Wardenclyffe Tower was largely or entirely inactive at that time. A number of theories based on UFOs have claimed that the Tunguska event was the result of the activities of extraterrestrial beings, including an exploding alien spaceship or even an alien weapon going off to "save the Earth from an imminent threat". These claims appear to originate from a science fiction story "The Explosion" by the Soviet writer Alexander Kazantsev in 1946, in which a nuclear-powered Martian spaceship, trying to land on the Earth, malfunctions and blows up in mid-air. Kazantsev never visited Hiroshima, but his idea of the above-ground explosion of the Tunguska space body was inspired by the news about the nuclear explosion over the Japanese city, as well as by his talks with some leading Soviet nuclear physicists. Many events in Kazantsev's tale, which was intended as pure fantasy, were subsequently confused with the actual occurrences at Tunguska. The nuclear-powered UFO hypothesis was adopted by the TV critics Thomas Atkins and John Baxter in their book The Fire Came By (1976). The television series The Secret KGB UFO Files (Phenomenon: The Lost Archives) in 1998, referred to the Tunguska event as "the Russian Roswell" and claimed that crashed UFO debris had been recovered from the site. In 2004, a group from the Tunguska Spatial Phenomenon Foundation claimed to have found the wreckage of an alien spacecraft at the site. In 2009, Dr. Yuri Labvin, the president of the Tunguska Spatial Phenomenon Foundation repeated these claims, based upon findings of quartz slabs with strange markings on them found at the site, which, he claims, represent the remnants of an alien spaceship's control panel. Astrophysicist Wolfgang Kundt has suggested the Tunguska event was caused by the sudden release and subsequent explosion of 10 million tons of natural gas from within the Earth's crust. The similar verneshot hypothesis has also been suggested as a possible cause of the Tunguska event. 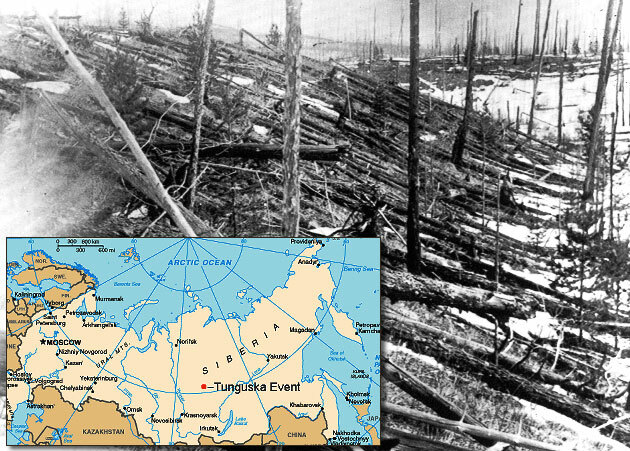 The Tunguska event is the strongest, but not the only, example of unexplained explosion events or meteorite air-bursts in recent history. There have been a number of similar events, the Curuca in Brazil even as the developments in satellite and radar tracking have reduced the likelihood of undetected meteors.